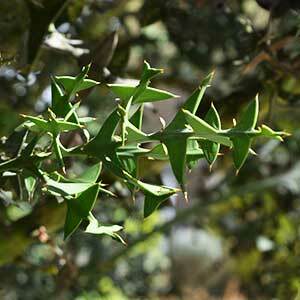 One of the more unusual plants, Colletia paradoxa is a rare tree from South America. This is a leafless tree with modified, flattened stems that appear in opposite pairs that act as leaves. It is not widely grown, however it could well be the ultimate in barrier plants. It has two common names, firstly the Anchor Plant, and this comes from the shape of the modified stems. It is also known as the Crucifix plant, this could be because of the look of the stems or maybe because of the likelihood of it drawing blood if touched. The leaves are very hard and very sharp, they are said to look like like boat anchors of airplane propellors. Colletia paradoxa is rare in cultivation, and not widely offered for sale, although it is not difficult to grow. A small woody evergreen tree growing to around 4 metres in height. It does have small white bell shaped flowers appear in autumn. Flowers are fragrant and attract bees to the garden. This is a plant that has sharp spines on the branches, it does need to be planted away from pathways or indeed any position where it will be easily touched. Growing conditions are best in a well drained soil. Best in full sun, although the Anchor Tree will grow well in some shade in warmer climates. It is frost tolerant, drought tolerant and heat tolerant. Certainly unusual and certain to be an attraction. Grow it in a container, or in the garden, however do grow it well away from where it might be brushed against. Look for seeds online to grow this plant, although they are hard to come by and difficult to germinate successfully. It is also possible to propagate this plant from cuttings. Be patient, it may take a year or two to develop a root system.